Discussion in 'Events and Tournaments' started by NojaMan, Mar 1, 2019. Since we have recently reached 1000 members in our official discord server we have something special for you! First of all, you need to be in our discord server. Every Sunday we will prepare you a couple of questions. The participants need to reply within 5-10 seconds to the question with "Yes/No" or other options to reply to the question. The participants who wrote the correct answer will pass to the next questions. The participants who wrote the wrong answer will not pass to the next phase. If you did not write the answer to the question within 5-10 seconds it will be considered a wrong answer and you will not pass to the next phase. The questions will be related to ToyHeroes and general knowledge. The last persons who replied correctly to all the questions will get the winner rewards. -Questions either have to be answered with "Yes" or "No", or with other words that are given as a possible choice. -Verbal abuse, inappropriate behavior, negative attitude will get you disqualified and muted. -Account sharing during the event is prohibited! -You are not allowed to participate and register with more than one account. 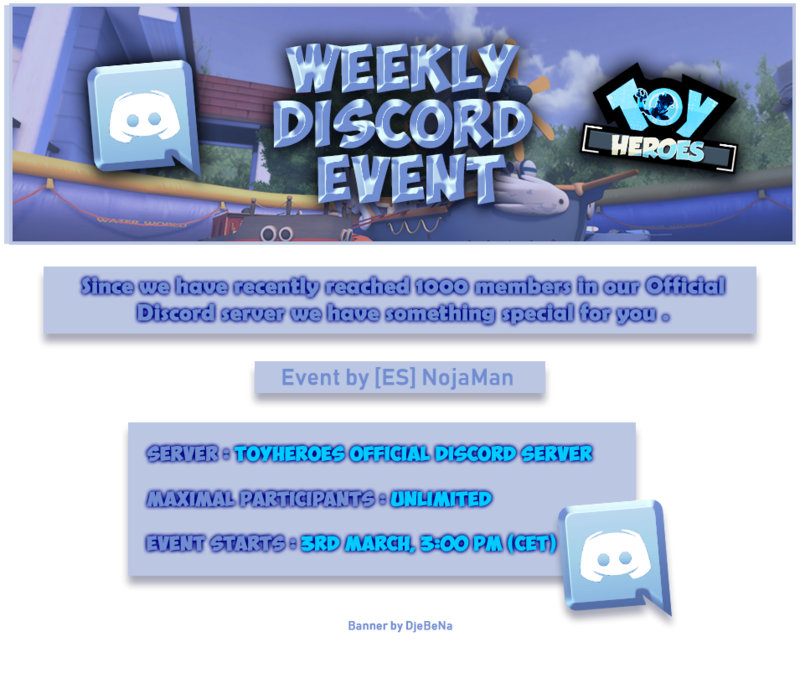 I, (Discord name + tag - example: Event#4400), IGN (In game nickname - example: [ES]NojaMan) am able to show up on Sunday at 3:00 PM (CET). I also fully agree with all the rules. Make sure you already are in the discord server before registering. If you are muted, banned or kicked you are not allowed to participate until the period of the punishment is not done. In case you have any question related to the event, please contact me on discord in private: NojaMan#4102. Auctoros and depressional like this. I, (DjeBeNa#6773 ,DjeBeNa am able to show up on Sunday at 3:00 PM (CET). I also fully agree with all the rules. I, (Naof#2469 am able to show up on Sunday at 3:00 PM (CET). I also fully agree with all the rules. I,(JOHN#5648 am able to show up on Sunday at 3:00 PM (CET). I also fully agree with all the rules. I, ( Balks#6273 / [ES]Solaire ) am able to show up on Sunday at 3:00 PM (CET). I also fully agree with all the rules. I, Alexia#2965, am able to show up on Sunday at 3:00 PM (CET). I also fully agree with all the rules. I, (Linley#4032 am able to show up on Sunday at 3:00 PM (CET). I also fully agree with all the rules. I, (Riv#9547, IGN: Riwy) am able to show up on Sunday at 3:00 PM (CET). I also fully agree with all the rules. Edit the message and write you IGN (In game nickname) so I will not ask you after the event and it will be easier for me. I, (Grizi#6299/IGN: Grizi am able to show up on Sunday at 3:00 PM (CET). I also fully agree with all the rules. I, (Hayate#1797, IGN: Hidan) am able to show up on Sunday at 3:00 PM (CET). I also fully agree with all the rules. I, (Missing#3718, IGN : Missing) am able to show up on Sunday at 3:00 PM (CET). I also fully agree with all the rules. I, (RaresGRG#5911), IGN (LilPwp) am able to show up on Sunday at 3:00 PM (CET). I also fully agree with all the rules. I, (Katarina#5944, IGN : ThereIsAndy) am able to show up on Sunday at 3:00 PM (CET). I also fully agree with all the rules. I, Karol#9739, QueenBey, am able to show up on Sunday at 3:00 PM (CET). I also fully agree with all the rules. I, (DuartePlays#8741), IGN (DuartePlays) am able to show up on Sunday at 3:00 PM (CET). I also fully agree with all the rules. I, ( miguei#1337) ign:Swe am able to show up on Sunday at 3:00 PM (CET). I also fully agree with all the rules. I , (The321#5479/IGN: the321 i am able to show up on Sunday at 3:00 PM (CET). I also fully agree with all the rules.